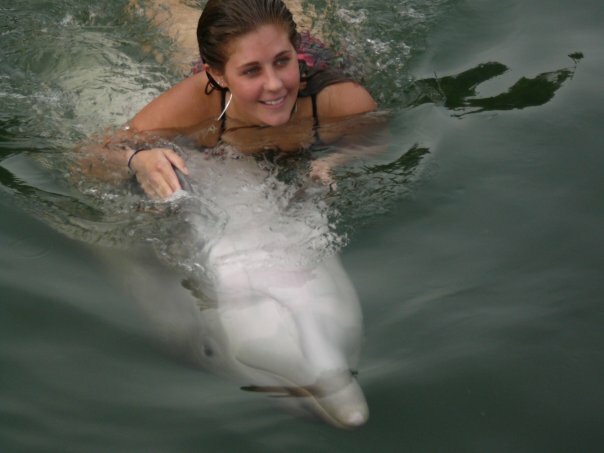 After my internship at Dolphin Research Center in late 2007, I had the opportunity to do another internship at Dolphins Plus in Key Largo. It was really neat to see how very different two dolphin facilities can be. 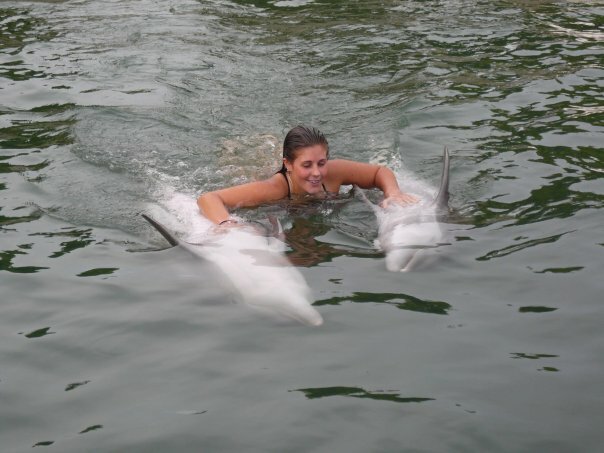 My favorite thing about Dolphins Plus was that they were much more relaxed than the Research Center was. Almost every time I walked down on the dock a trainer would say “Hey, will you jump in the water and help me with this training?” Dolphin Research Center was much more exclusive as to who they would allow in the water to assist with training. One of my first days at Dolphins Plus, I decided to go down on a dock to meet/observe two dolphins I had never met before. Their names were Fiji and Squirt, mother and son. I sat Indian style next to the trainer who was free feeding the two. I was watching them, admiring their obvious love for each other, when they both swam over to where I was perched on the dock and reached their heads up to touch my legs. The trainer told me to put my legs in the water to see what they would do. They swam by over and over again, nuzzling my legs. 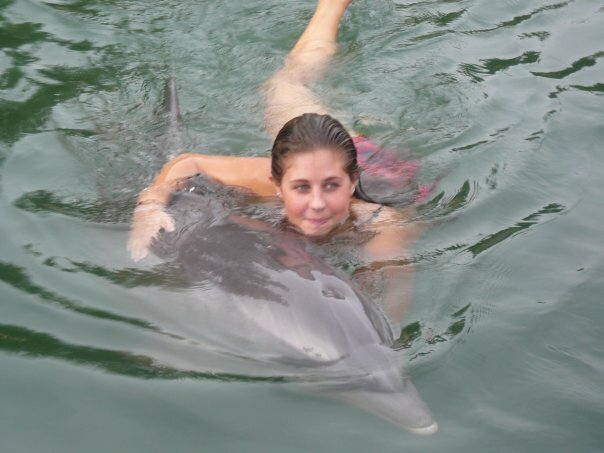 It was the dolphin equivalent of when a cat rubs itself on your legs, making sure every inch of it’s body is touched by you. The trainer laughed out loud and exclaimed “I’ve never seen them do this to anyone before, much less a stranger! I think you should get in. I think they want you to get in.” She didn’t have to ask me twice. I grabbed a mask and jumped in. Even retelling the story right now I can’t believe it. I feel like it must have been a dream. It really was my wildest dream come true. 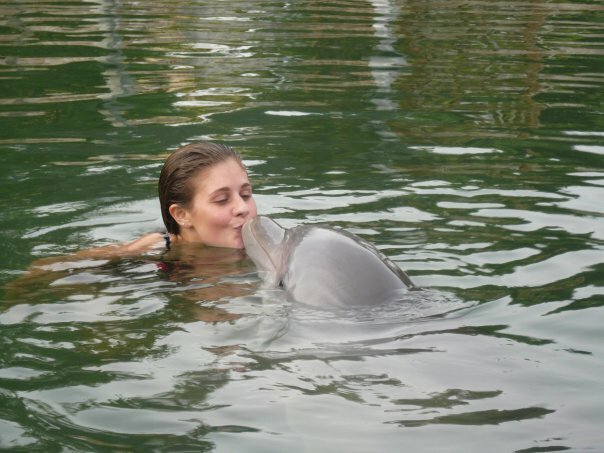 I am forever grateful to Fiji and Squirt for allowing me to take part in their dolphin playtime. For 30 indescribable minutes they let me feel like one of their own, a true pod-mate. May 31, 2011 in All Posts, Photo.